So, the Cascadia Region Earthquake Workgroup has updated its scenario document for what that magnitude of quake would do to us now. The very advances that are the foundations of our modern communities create vulnerability along with convenience said Michael Kubler, Cascadia Region Earthquake Workgroup (CREW) President. The revised Cascadia scenario is a crucial tool for regional leaders to use in developing policies and plans for the next earthquake. Events over the last few years have expanded our understanding of earthquake science and the hazards faced by our region from a future Cascadia Subduction Zone earthquake. Digging into the soil at the Effingham Inlet in British Columbia, Canadian scientists have confirmed that a city-destroying megathrust earthquake in the Northwest is due. The Cascadia Subduction Zone running the length of the coast from northern Vancouver Island down to California last slipped and shook the surface of the Earth 300 years ago, and that was just the latest of 22 such quakes in the past 11,000 years. The scientists, whose work is published in the latest Canadian Journal of Earth Sciences, used a new aging model for identifying and dating disturbed sedimentary layers in a core raised from the inlet. The disturbances appear to have been caused by large and megathrust earthquakes that have occurred over the past 11,000 years, According to a science news site run by the American Association for the Advancement of Science. … the Bulletin of the Seismological Society of America … found that damage from earthquake-triggered landslides will be worse and more widespread in Seattle than previously thought. The study focused on the Seattle Fault, a 30-mile fracture that runs east-west through Seattle, under CenturyLink Field and over to Issaquah. Capable of inflicting mass damage, it’s due for another rupture, but no one knows when. “A major quake along the Seattle Fault is among the worst case scenarios for the area since the fault runs just south of downtown,” said Kate Alltstadt, a University of Washington doctoral student and co-author of the study. The last Cascadia Subduction Zone earthquake occurred one hundred years before Lewis and Clark saw the Pacific Ocean. It was a time when native traditions spoke of the ground shaking and the waters rising. There were no bridges to fall and no schools, hospitals and other critical infrastructure in tsunami inundation zones. It was a time when Cascadia was much more resilient than today. The Cascadia Subduction Zone extends along the coastlines of northern California, Oregon, Washington, and southern British Columbia. There’s no doubt that Cascadia is capable of producing earthquakes and tsunamis on the same scale as the magnitude 8.8 earthquake off Chile in 2010 and the magnitude 9.0 quake that devastated the east coast of Japan in 2011. 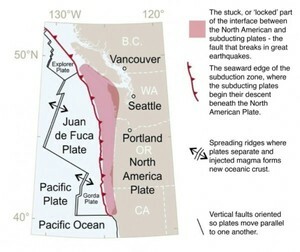 Cascadia’s last great earthquake occurred on January 26, 1700 and stresses have been building on the fault ever since. While the full extent of the earthquake hazard was not realized until the 1980s, the Cascadia subduction zone is now one of the most closely studied and monitored regions in the world. In 2005 CREW first published the Cascadia earthquake scenario, but so much new information has emerged that an update was needed² said Heidi Kandathil, CREW Executive Director. The newly updated Cascadia Scenario joins the list of other free products developed by CREW to help the region¹s residents, schools, businesses, planners, and emergency managers prepare for future earthquakes. The Scenario and other materials are available online at http://tinyurl.com/m34v2ex.